This Wednesday, May 28, 2018 is “Ivy Day,” when all eight members of the Ivy League release their undergraduate admissions decisions. In honor of Ivy Day, our founder and CEO Ben Stern will become the first person to visit all eight schools in a single day. (We don’t think this has ever been done; if you have and can prove it, please let us know.) He will be accompanied for at least part of the trip by Columbia University student Mohak Sharma. Accounting for traffic and gas stops, total driving time will be about 15-16 hours. With half an hour for each stop, total time should be around 19 hours. Departing at 5AM should allow Ben and Mohak to arrive in Philadelphia by midnight. He lives in New Jersey and would like to minimize his overall driving time. 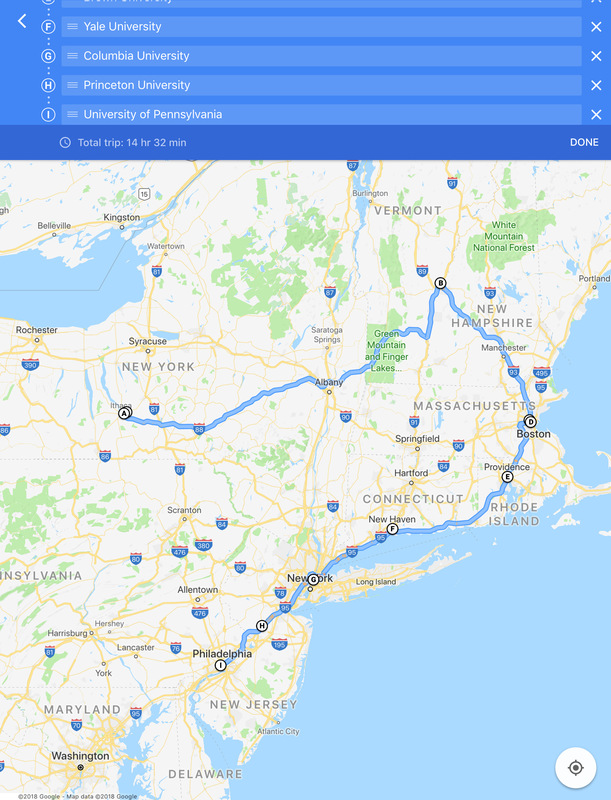 Following the shortest route, ending at Dartmouth or starting at Penn would require significant additional driving back to central New Jersey, whereas Penn is about an hour away. Ben wants to avoid driving in rural areas at nighttime. Starting at Cornell and ending at Dartmouth or vice versa would mean doing significant rural driving both early in the morning and late in the evening. Sunrise on Wednesday is just before 7AM EDT, so most of the trip from Cornell to Dartmouth will be after dawn. Ben enjoys driving in beautiful Upstate New York! New York driving would be limited on the shortest route. To track our progress, follow us on Instagram and Facebook!